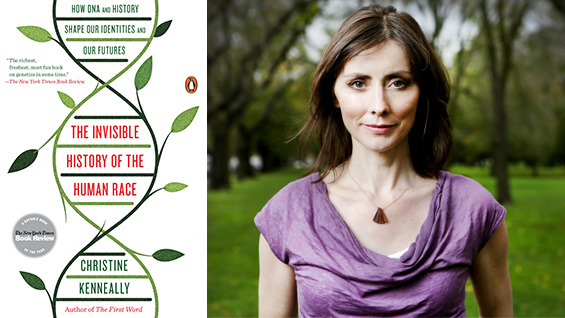 Christine Kenneally will discuss her latest book, The Invisible History of the Human Race: How DNA and History Shape Our Identities and Our Future in a free, public lecture. In the book, she explores how the new science of genomics and new ways of thinking about history and the evolution of ideas are exposing for the first time what is actually passed down from generation to generation. Because the history of the human race is essentially a legacy of ideas, documents and DNA, we can’t begin to understand the full power of the genetic record, unless we also explore the hidden ways that ideas and documents are passed down. The Invisible History of the Human Race opens with a history of ideas that shape how we think about DNA, identity, and how we feel about family history versus big history, and the notion of the past itself. Kenneally visits the company ancestry.com and examines our modern obsession with lineage. The book then moves back in time to report on the new ways that history and biology can work together to reconstruct individual lineages. It covers cutting edge science that can detect the historical flavor of an individual’s genome. Tracking further back, it explores the genetic tribes we belong to, and the fact that while race is not a biological reality, ancestry certainly is. Finally, it explores what our personal genome can tell us about where we (individually, as families, as tribes) fit into the most distant history of human beings. Christine Kenneally is an award-winning journalist and author who has written for The New Yorker, The New York Times, Slate, Time magazine, New Scientist, The Monthly, and other publications. She is the author of The First Word: The Search for the Origins of Language, which was a finalist for the Los Angeles Times Book Award. She was born and raised in Melbourne, Australia, and lives in New York City.